This Rainbow was just too big for Bo’s Brodin boat net! 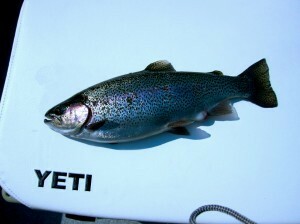 The Yeti Rainbow looks like a fat Tuna. Yesterday Bo and I got to just go fly fishing. Bo got into some of the fattest Rainbows of the year. Don’t know what these fish have been eating but it took both hands to hands to hold these fat boys. 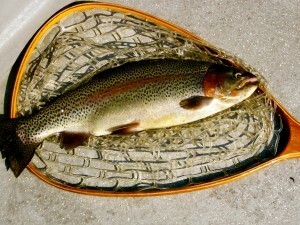 We caught a bunch of these beautiful Rainbows on #16 PBS’s and #16 Copper Pheasant Tails. There has been some very beneficial rainfall over the past week which should result in some beautiful fall foliage over the next few weeks. We still have some good fall fly fishing dates available so book your trip with Empty Creel Fly Fishing Guides and Outfitter and get hooked up on some of these fatty Rainbow Trout. Sure wish I could figure out how to use a camera!